There are four types of Actions you can take. Message; an emailed message to the recipients of your choice. This is the most common type of action used. Phone; provides a call-in script and contact numbers so your advocates can call the recipient of your choice. Petition; provides an online petition for your members to sign. Media; provides a list of media contacts for your advocates to contact. 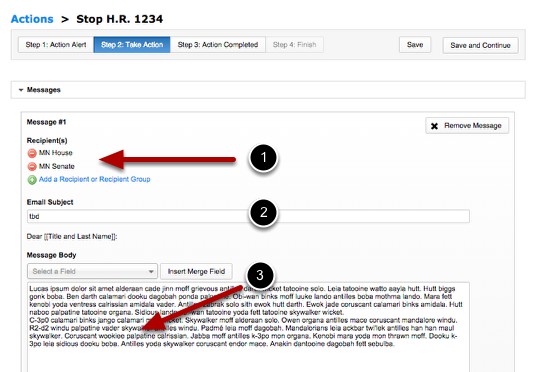 The list is generated based upon your advocates' address. Since Message is the most commonly used selection, this tutorial will focus on that action type. Click here for more information on the different types of Advocacy Actions. Message type determines the form the content will take. 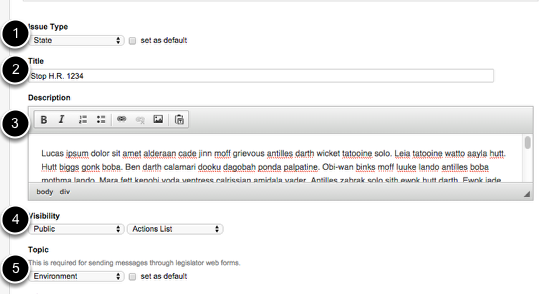 Only a Message Action and a Phone Action have customizable message types. Click here for more information on the different message types. Standard, a standard written form letter. Sender-Specific; a form letter with personalized content based upon the advocate taking the action. Paragraph Selector, a partially written form letter with the ability for the advocate to add their own content. Standard, a standard written script. Sender-Specific; a script with personalized content based upon the advocate taking the action. The Action Alert is the message which will be posted on your site. 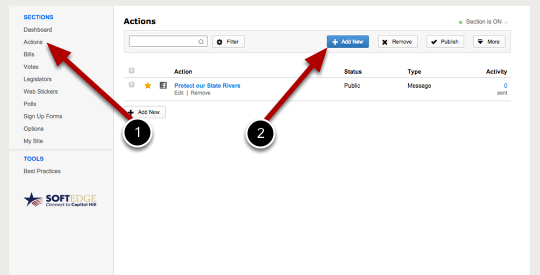 Click here for Advanced options available for your Action, such as background content, bill integration and vote tracking. This is the message which your advocates will send to the recipients. Recipients are determined by the issue: federal or state. Customized recipients can be added to the message. Advocacy Actions can also be customized by your advocates. Click here for information on letting your activists edit the message they are sending. Customize the different ways to thank your advocates and encourage them to take further action. All of these options, except for the Action Completed page, are optional. Publish; publishes your Action to your site. If your Action is Public, it will now be visible to your Advocates. 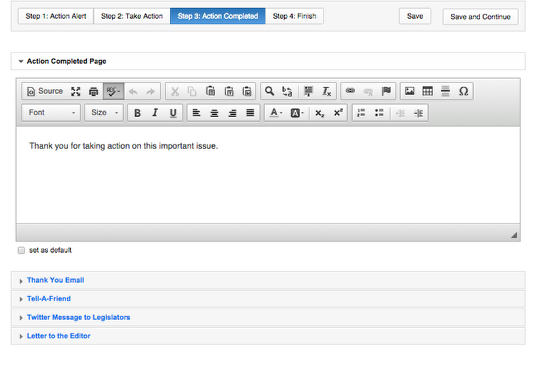 Actions can be scheduled to publish at a specific time.